The Great Library is the jewel of Osgoode Hall. To take nothing away from the beauty of the Benchers' Quarters and the grandeur of the Courts, it is the Great Library that takes your breath away. Upon entering the Main Reading Room, one is immediately overwhelmed by the magnificence of this space and enveloped by a sense of legal and architectural history. The Great Library is the largest private law library in Canada, holding approximately 125,000 volumes. Until 1827, the Law Society did not have a library. In January of that year Convocation unanimously resolved that "Treasurer William Warren Baldwin, the Attorney General, the Solicitor General, and Mr. Macaulay be a committee to determine what books shall be purchased for the Society - not exceeding the value of 200 pounds - and that said committee be directed as soon as convenient to procure the same." In accordance with Convocation's instructions, Solicitor General Henry John Boulton purchased a number of books while in London, England later that year. As the Law Society did not yet have a permanent residence, the books were kept in a room in the Court House, which stood north of King Street and east of Church Street. They remained there until the doors of Osgoode Hall opened in 1832. From its beginning, Convocation had shown great interest in building a library that could be used by members of the profession. As a result, a space in the new building had been specifically designated for this purpose. The original library was located in the area that today houses the Male Benchers' Robing Room. At a meeting of Convocation in 1832, Treasurer Baldwin suggested that if it were deemed expedient to borrow to pay the debts of the Society, "a small sum might be added to be appropriated to the purchase of Books, more than two years having elapsed since any sum had been devoted to that essential object." Over the next few years many books were purchased and many more were donated. The largest individual gift of books ever made was that of the "Riddell Canadian Library" consisting of about six thousand volumes, presented by the late Mr. Justice Riddell in 1916. Not surprisingly, the library quickly outgrew its allotted space. Between 1844 and 1846, the original building was expanded with the construction of a west wing for the use of the Courts and a centre portion in which the burgeoning library holdings could be housed. The centre portion was enlarged again and renovated to its present state between 1857 and 1860. Frederic William Cumberland and William G. Storm created the design for this final renovation. Cumberland, one of the leading Toronto architects of the 19th century, was responsible for the rich style and Storm for the lavish ornamentation and mouldings. Some of the distinguishing features of the Great Library included its stately columns, ornate fireplace, etched and stained glass windows and intricately designed ceiling. The formal opening of the newly renovated section was held on the evening of September 8, 1860. In attendance at the reception and ball were Edward, the Prince of Wales (later King Edward VII), Treasurer J. Hillyard Cameron, Chief Justice Robinson, the Benchers of the day and a number of local dignitaries and special guests. After a brief address by Treasurer Cameron, the Prince was escorted to the Library where amid loud cheers he was made an Honorary Bencher of the Society. Dinner and dancing followed and the party did not break up until well after midnight. In an article published in The Globe on September 10, 1860, it was reported that, "there is not in America a more magnificent building devoted to the law than Osgoode Hall. All that architecture can do to charm the eye or impress the mind with a sense of splendour is there." The Library was the largest room in the building measuring 40' high x 40' wide x 120' long. It had been designed to function as a working library and a banquet hall, ballroom or assembly room as the occasion required. Over the ensuing years, many meetings, receptions, dinners and dances were held in the Main Reading Room. The Library was also the area where the bodies of distinguished members of the profession would lie in state if their families so desired. 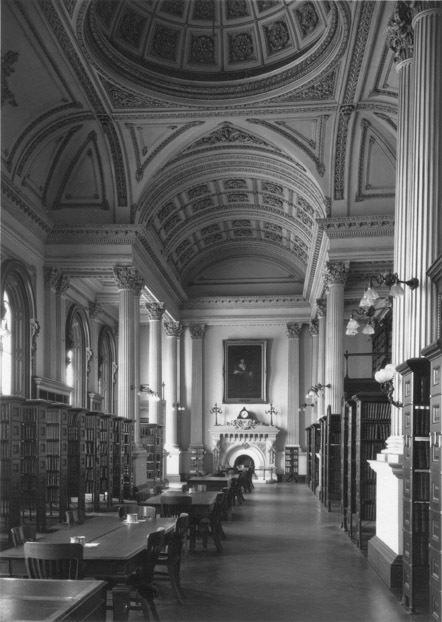 In the second half of the 20th century, the use of the Main Reading Room as an audience hall all but ceased except when it played host to the Society's Remembrance Day ceremonies. The Great Library has provided educational and reference resources for generations of students-at-law and lawyers. It has evolved and adapted to the changing legal landscape in order to continue to serve the legal profession. In an era when changes to the law are occurring rapidly, there is an ever-increasing need for easy and convenient access to legal information and resources. In addition to its paper holdings, the Library not utilizes CD-ROM products and online services. Reference inquiry services, whether through e-reference, telephone or in person continue to be well utilized. The Great Library truly is the jewel of Osgoode Hall due not only to its architectural beauty but also for the invaluable service that the members of the Library staff provide to the profession.